Financed by Microsoft co-founder Paul Allen, SpaceShipOne becomes the first spacecraft developed by the free market to enter spaceflight. 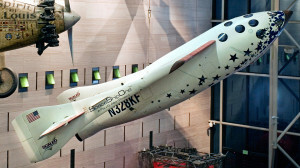 Launched from a mothership named White Knight, SpaceShipOne flew just beyond the atmosphere into the threshold of space then glided back to Earth. SpaceShipOne would later win the $10 million Ansari X Prize for the first non-government organization to launch a reusable manned spacecraft.